So here's the deal. Chocolate is going to make an ever so brief comeback. I decided that in the spirit of upcoming Valentine's Day, I could do one, just ONE more restock. So if you liked it, and asked for it, and neeeeeeeed it.......last chance! 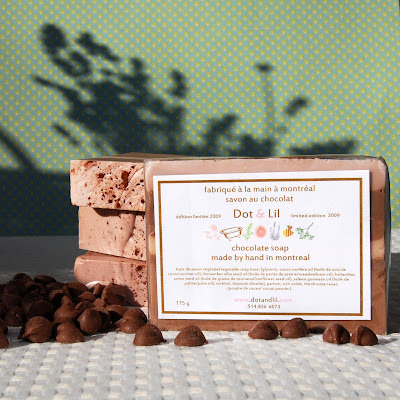 I am making a double batch of Dot & Lil limited edition chocolate soap as I write this. And once they're done....too bad so sad! Also, Dot & Lil may be doing a show in early February so that you can all stock up for Valentine's Day...details to follow!